I very much dislike having to point out errors in other blogs publicly. I generally prefer to leave a comment or e-mail in hopes that the author will correct the error. Recently I found a blog post that at its root was incorrect. I left a comment explaining the error, in hopes the author would correct the issue. However, it’s now been one week and no changes or updates have been made. Further my post is still awaiting moderation while a comment made after mine has been approved. The post in question is at a site called technixupdate, and begins with the assertion "Windows 7 taskbar does not allow to pin a shortcut or folder path directly to the taskbar, as only program executable can only pinned to the taskbar by default in Windows 7." (Note that’s an exact quote.) The author then goes through this rather convoluted technique of creating a fake executable file to accomplish the task. Unfortunately, the very opening statement is incorrect. Windows 7 taskbar does indeed allow you to pin shortcuts to it. Let’s look at a brief example to illustrate. On my D drive I have a folder named Data. I’d like to create a shortcut to it on the taskbar. Let’s start by first opening up your "My Documents" folder. I could place the shortcut anywhere, but My Documents seems like a convenient place. Once there right-click then select New, Shortcut from the menu. 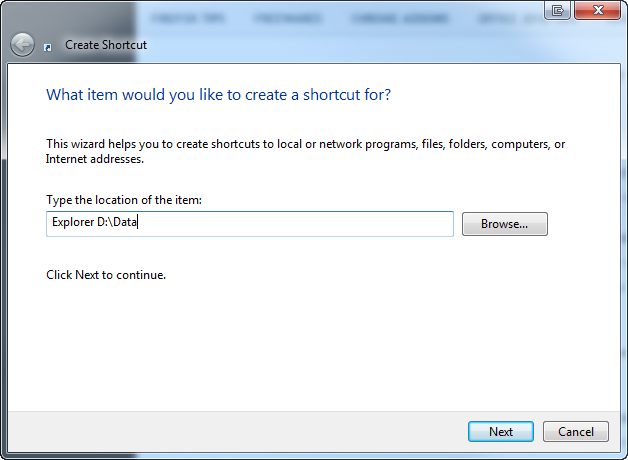 In the dialog that appears simply type in Explorer “D:\data”. Note that you only need to use the quote marks around the drive and path if your folder names have a space in them. In the screenshot below you can see that I was able to safely omit the quotation marks since there are no spaces in my folder. Once you’ve entered Explorer and your drive / folder you can click next. As you can see I replaced the default text of Explorer.EXE With something more meaningful, in this case the word Data. 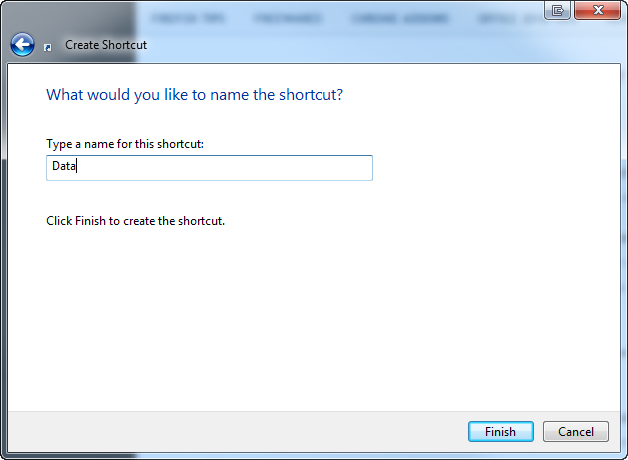 I simply click Finish to complete creating a shortcut. Now that we have a shortcut, it is a simple matter to pin it to the taskbar. 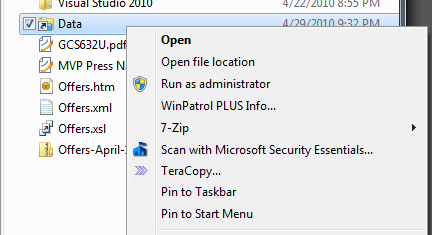 Simply right click, then select "Pin to Taskbar”. As you can see from the image below, I now have a shortcut to my Data folder on my Taskbar. This technique will work with any shortcut you wish to create. I hope this will correct the record for those wishing to use this technique. Finally, even though his facts were a little off, I do want to give the author credit for blogging and trying to help out the community. Today is April 24, 2010 and I’m in Atlanta speaking at SQL Saturday number 41. I’m giving three sessions today. I guess I’m just a glutton for punishment, LOL. My first session is an Introduction to Business Intelligence / Data Warehousing. In it I am covering the basics, it’s a true introductory talk where we’ll demystify all the buzz words surrounding Business Intelligence. You can download the slides from here. My next session is Off and Running with PowerPivot for Excel 2010. Learn the ins and outs of this exciting new tool from Microsoft, see how you can enable your users to do their own Business Intelligence. The slides are ready from this location. OK, an update before this blog entry even posts, Vidas Matelis just published his step by step guide for getting SharePoint 2010, SQL Server 2008 R2, and PowerPivot all up and going on a single box. (And when I say just, I mean it went up just as I was typing up this post.) Vidas knows a lot about PowerPivot, it’s a great blog to add to your short list. I have a link to his blog in my slide deck, but wanted to pass along a specific link to his install guide, you can find it at http://powerpivot-info.com/post/66-step-by-step-guide-on-installing-powerpivot-for-sharepoint . The final session I’ll be doing is on Full Text Searching. You can download the code samples and slides from my Code Gallery site, http://code.msdn.microsoft.com/SqlServerFTS. Speaking of Full Text Search, I’ll be doing an Interactive Session at Tech-Ed in New Orleans on Full Text Searching. The session is now in the catalog: http://northamerica.msteched.com/topic/list?keyword=DAT07-INT If you are coming to New Orleans for Tech Ed I’d love to see you there. I’ll also be in the Microsoft Data booth during part of the event, so come on by and say Hi! I hope to be able to sneak in a few sessions today as well, there will be 49 different sessions at SQL Saturday #41 to pick from (7 tracks, and 7 sessions per track) so it promises to have something for everyone. If you want to follow the fun on Twitter, our official hash tag is #sqlsat41 . SQL Saturday 41 was sold out some time ago, and there is even quite a waiting list, so if you’re unable to attend then at least you can sit in on three of the sessions via the live stream. The other two sessions to be streamed are "SQL Server Memory Deep Dive" by Kevin Boles and "Database Design Patterns" by Louis Davidson. Both are fellow Microsoft MVPs and excellent presenters, I know you’ll enjoy their presentations as well. Live streaming technology really excites me. While I feel that you can get the best experience and education from being live at the event, I also understand that this is not always possible for everyone. Work conflicts, distance, family obligations, or the event simply being sold out, as this one is, can limit a person’s ability to attend in person. Live streaming events such as SQL Saturday really helps us to extend our reach into the community and to help serve those who for whatever reason cannot be with us at the event. I want to give a great big thanks to the folks over at Set Focus for making this happen. Last year I did a week long series called “The Podcast Junkie”. (The link is for the first day, but be sure to check out each day of the week for a list of casts.) I’m still a Podcast Junkie, and if anything listen or watch more now than I did last year. Having the ability to hook up my Zune to my TV (either through my XBOX 360 or in the Zune docking cradle) makes it very convenient. In the evenings I often drop my Zune into the dock and kick back with some podcasts. Right now I’m in the process of reformatting my main laptop and reinstalling everything. I’ve spent a lot of time working with Beta then Release Candidate software over the last year and all the install / uninstalls have likely contributed to the instability of my machine. Not an unusual thing for developers to go through. I keep all of my data, with two exceptions, on drives other than C so I have almost no data to back up, thus the process goes very quickly. One is my Microsoft Outlook files, easy enough to backup and restore later. The other is my Zune media. My music, videos and audio books are all on external USB drives, so when I reinstall the the Zune software all I have to do is point it at the drives then kick back and wait for it to index all of it. My playlists are stored in C:\Users\[your username here]\My Music\Zune\Playlists, so I just copied those to a backup device and will restore after the Zune software is reinstalled. The podcasts though are a bit more painful. Yes I could back them all up, but I’ve found just as with a reformat of the PC, so too does a reset of your podcast list benefit you. In the process of resubscribing to my podcasts I wind up weeding out a few I haven’t listened to in a while. More importantly I also wind up finding new ones to subscribe to, which is the fun part. It’s rare I have time to just sit and look through all the newly added podcasts, so this is a good opportunity to find new material to enjoy and learn from. So then I get to the question of how best to backup my list. Last time I just went to the Zune Podcast folder and grabbed the list of directory names which match the podcasts I listen to. This time I decided to be a bit more creative, and did screen captures of the list and then merged them into one picture. The result turned out pretty cool, so I thought I’d share it with all of you. 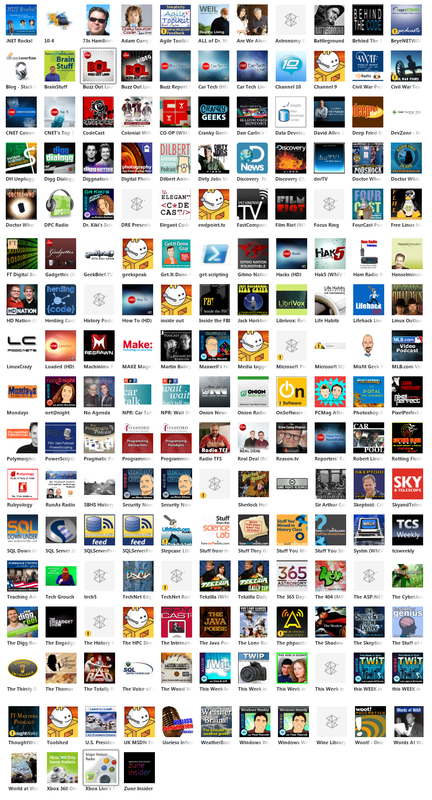 Just click on it to see the full size picture to see the podcasts I’m currently addicted to. I don’t try and add all of them at once after I reinstall. Instead I start with the ones that are most important to me and add them first. I’ll let those download and sync with my Zune so I can be enjoying them while downloading the rest. To keep up with which ones I’ve gotten so far, I’ll make a copy of this picture to act as a check list. As I add each one to my collection, I’ll simply go to my picture editor (I like Paint.Net), use the selection tool to select the podcast and it’s name, then just hit delete. Eventually I should wind up with a blank picture. One last piece of advice, after you have reset your library on your newly formatted computer, you need to also wipe your current content from your Zune. Your Zune anchors it’s data to the PC it came from, so it thinks your reformatted computer is a “new” PC and will lock away your old content to protect it. You wind up with a big portion of your Zune’s storage space being taken up by media you can’t get to. To reset your Zune content, hook your Zune up to the computer, then in the software go to Settings (in the upper right). In Settings, click on Device. The top left menu item, Sync Options should be what you are on. At the very bottom you’ll see “Erase All Content”, you want to do this prior to syncing up any music or podcasts. Warning!!!! Make sure you have all the content on your Zune backed up that you need backed up. As I mentioned earlier, all my music and video on external drives, and my podcasts I’ve just redownloaded, so I don’t have anything on my Zune that I’ll lose, but your situation may be different. Also note that when you do this, it will also delete the games, if you have the games installed. To reinstall the games, while still in the Settings, Device menu go down to Player Update. After making sure your player is up to date, you should see a button that reads “Install Games”. I’m sure by now you’ve deduced that just clicking it will reinstall the games. Not having the games gives you extra space for music, etc. If you have a bigger Zune like the 80 or 120 you probably won’t notice the missing space, if however you have a 4 gig model you might want to think about it.